My blog friend and fellow recycled crafter Carmen is back to share a cool project that she created using old denim from jeans. She used the jeans, along with bandannas and other recycled materials to decorate these flower pots. Here is another denim pot she covered and used a pocket too. 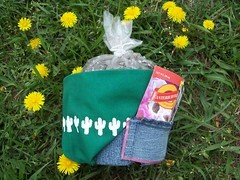 She created a fun gardening gift package with this project. You can see Carmen’s step-by-step photo tutorial here to help you create your own unique recycled denim pot cover. What a clever and cute recycling idea. I really like the pot covers a lot and the gardening gift pack with pocket is sweet. Aside: Your blog is so well organized. I really like this fresh and clean theme with the subdued colors because it’s highly readable, and also because it frames the content in your blog so well. The link within widget is a brilliant addition. I’ve had such a positive experience with it and I’m sure you will too. TT — Thank you so much for the kind comments and feedback on my template. It is helpful to hear from others on what widgets and other plugins are useful for a blog and for the readers. Great denim ideas!! I just LOVE these pots, and all of the other denim ideas you post on your blog! I explore many posts here on this blog, and I must say, you are really a creative person. You have shown some amazing re-usable ideas for various things. Thanks, and Keep it up.